It is not unusual for England teams visiting Australia to be written off before they arrive, usually by the locals, but on occasion by the English media as well. There is not a great deal of optimism this time round, especially since Ben Stokes became hors de combat, although the prospects are not quite as grim as in 1986, when Martin Johnson famously wrote of Mike Gatting’s side; There are only three things wrong with this England team, they can’t bat, can’t bowl, and can’t field. Johnson has dined out on his comments ever since, England confounding expectations to take the series 2-1, a scoreline that belies the ease with which the victory was achieved. Another example to give hope to 21st century England supporters comes from over a century ago, and the series of 1903/04. That story begins 18 months before the tour, with the 1902 series in England. The Golden Age was at its height and the England side a richly talented one. The batting was dominated by a famous group of amateurs; Ranjitsinhji, CB Fry, Stanley Jackson, Archie MacLaren and Gilbert Jessop. The bowling was in the hands of the professionals, Wilfred Rhodes and Bill Lockwood were by far the most successful in the Tests, backed up by the likes of George Hirst and Len Braund and, just once, Sydney Barnes. Despite the strength of the England side they lost the 1902 series 2-1, their fourth successive reverse. Australia’s victory in the fourth Test, Fred Tate’s match, and England’s consolation win in the fifth, Jessop’s match, are amongst the most famous in the annals of the game. When MCC cast their eyes around for a side to go to Australia in 1903/04 they had real problems putting together a strong side. None of the amateur batsmen mentioned above were available, Lockwood was almost at the end of his long career, and the mercurial Barnes, who preferred to ply his trade in the leagues, was not invited. Skipper Pelham Warner apart the only amateur batsman in the party was 25 year old Reginald Erskine Foster, a man who had barely played any First Class cricket in 1903. Even the man himself could not explain where the nickname ‘Tip’ came from, but Tip it always was. He was the third of seven brothers who all played for Worcestershire in their earliest days as a First Class county, so much so that the county was often nicknamed ‘Fostershire’. If the inclusion of Tip in the touring party was a surprise it should be stressed that was not because there was any doubt as to his quality as a batsman. He had made a slow start in the game but had quickly established himself as a top class player. His First Class debut had come in 1897 for Oxford and although his returns were not particularly impressive Wisden noted that he plays in fine commanding style and has plenty of hitting power. In terms of his numbers 1898 was a disappointment, although Wisden’s comment that he was a far better batsman than his modest average might lead one to believe proved prescient. Tip’s breakthrough came with the award of First Class status to his county. His deeds for Oxford in that summer of 1899 were nothing special, averaging under 30 and being fifth in their batting list. Wisden’s guarded praise was that he had played well on occasion. The Worcestershire correspondent was rather more impressed, describing him (along with older brother Wilfrid) as one of the two mainstays of the batting, and his average was a touch over 40. He and Wilfrid each scored twin centuries against Hampshire. They remained the only brothers to achieve that particular feat until the Chappells came along. The year in which Tip really arrived was 1900. He finished sixth in the national averages and was selected as one of Wisden’s five cricketers of the year for its 1901 edition. In fact the title of the piece was Mr RE Foster and four Yorkshiremen. There were twin centuries on two occasions. The second pair were in a thrilling Gentlemen v Players match at Lord’s. In a season without Tests the game was undoubtedly the high point of the English summer and the Players won a remarkable game by two wickets, successfully chasing down a target of 501 after two superb innings from Tip. Just over a week earlier he had put his name on the back pages by recording the, to that date, highest score of 171 in the Varsity match, a fixture that in those days was second in importance only to the Gents and Players at Lord’s. The appreciation in Wisden described Tip’s batting; As a batsman he has almost every good quality – a strong defence, self restraint when it is needed, a free, attractive style, and truly magnificent hitting powers all around the wicket. Scarcely anyone, Ranjitsinhji excepted, hits with less apparent effort, his facility in this respect being due to the possession of wrists that must be marvels of strength and suppleness. In 1901 Foster averaged over 50 again. That winter England were due to visit Australia and skipper MacLaren invited Tip to join his side. Unfortunately for MacLaren and England Tip needed to earn a living and the call of his stockbroking career was the one he heeded. The following summer he was available for only ten matches. He did reasonably well in those without matching his achievements of the previous two summers. He failed for Worcestershire against the Australians and then again when he played against them for an invitational eleven at the Scarborough festival late in the summer, and there seems to be no suggestion he was in contention for a Test place at any time. Like all of his brothers Tip was a fine all round sportsman and in addition to cricket he excelled at golf and rackets. Colonel Philip Trevor, at the time a well known cricket writer, described him as belonging to the could-do-anything-if-he-tried brigade. Tip was also an international footballer well before he gained a Test cap. On six occasions between 1900 and 1902 he played for England. A skilful inside forward in the last of those appearances, against Wales, he captained ten professionals. CB Fry, himself a footballer good enough to appear in an FA Cup Final, wrote in 1939; He had a fine dexterity of foot and controlled the ball, caressed and persuaded it with an almost animal cunning. His feet had, as it were, the Oxford accent. After a mere handful of appearances, not conspicuously successful, in 1903 it was no doubt a surprise to many to see Tip able to tour Australia. In fact he had recently married, and as his amateur status enabled him to take his bride with him the trip was effectively an extended honeymoon. The new Mrs Foster was Mary Cammell, from the well known family whose name is synonymous with shipbuilding. Brother Wilfrid had already married a cousin of Mary’s. Prior to the First Test both England and Tip did reasonably well, and Tip warmed up for the Test with a century in a minor match. On the morning of the first Test Warner lost the toss, to his disappointment at the time, but there was a sensational start as Australia slipped to 12-3. Tip started their woes when he caught the great Victor Trumper brilliantly at slip for one – in the days when fielders were much less mobile than they are today Warner’s description of the catch is rather quaint; Foster took a remarkably fast travelling ball with his left hand. The ball was very wide of the fieldsman, who fell over in making the catch. Australia recovered to 285 all out but that merely served to set the scene for Tip’s remarkable first visit to the crease in international cricket. Held back in the order to five Tip made his entrance at 73-3, so the game was evenly poised and, when the fourth wicket fell at 117, beginning to tilt in the home side’s favour. By the time the fifth wicket fell however England were in front, Tip and Braund having put on 192. Three more quick wickets then fell to even matters up before Tip, by adding 115 with Albert Relf and 130 with Rhodes, took England into a commanding lead. By the time Tip was finally dismissed for 287, skying a mishit to mid off, he had been batting for more than seven hours and was visibly tiring. Initially he had not batted entirely convincingly, and was dropped once on 49, but he warmed to his task. Warner expressed the view that Tip’s batting on the Monday, which included 80 in the final hour of his innings, was, I think, the best I have ever seen. The importance of Tip’s early catch was highlighted in the Australian second innings. Trumper came to the crease at the fall of the third wicket at 191. In one of his greatest innings he then remained for the rest of the innings being left unbeaten on 185 when the tenth wicket fell. England’s target of 194 was not as straightforward as they might have hoped but, thanks in the main to Hirst and Tom Hayward, they got there with five wickets to spare. Tip looked good in making 19 before Warwick Armstrong lured him out of his crease and he was stumped. England went two up in the second Test. The wicket was a tricky one and their first innings of 315 was decisive, none of the other three innings producing more than 122. Tip was unbeaten on 49 at the close of the first day, but he didn’t resume his innings the next day and missed the rest of the game with tonsillitis. The third Test proved to be a comfortable win for Australia. Twice Tip got going without making a significant contribution, his innings being 21 and 16. There was some mitigation however, in Warner’s words his recent illness had left him rather weak, and he was further handicapped by a bruised thumb. The series was decided in the fourth Test when England won again. In the first innings Tip scored 19 before being brilliantly caught at short leg. In the second innings Warner sent him in first and although he scored only 27, those runs and the time that was taken up whilst the wicket was at its most difficult, made the innings rather more important than it might at first appear. The dead rubber was a disappointment for England as they crashed to defeat scoring just 61 and 101. Tip did as well as anyone, top scoring in both innings with 18 and 30. There was not much time for the First Class game for Tip between 1904 and 1907, although he did make a spectacular unbeaten 246 against Kent in 1905 at a run a minute. In 1907, to the surprise of many, he played for most of the summer after accepting the England captaincy for the first visit by a South African side since their quartet of googly bowlers had humbled Warner’s 1905/06 tourists. Tip’s summer in 1907 was unspectacular in terms of numbers, but entirely successful. On the county circuit the batting of himself, well supported by brothers Geoffrey and Harry, led Worcestershire to joint second in the Championship and, although he managed just a single half century himself, Tip helped England to win the one decided Test match, and into a position of strength in the two that were left drawn. After his summer off Tip went back to the Stock Exchange but, if ever a reminder were needed that he was a class above most, he provided it in his next First Class appearance. In 1910, all but three years to the day since his previous First Class appearance, there was one County Championship fixture for which Tip made himself available. He chose to play at Worcester but, had he wanted a relaxing work out would surely not have chosen the fixture against Yorkshire. Unsurprisingly his side were soon 4-2 as they replied to Yorkshire’s 412. Tip led a partial recovery and was ninth out after scoring 133 from 205, Wisden commenting that he showed that he could bat as finely as ever. The last game of First Class cricket for Tip came in 1912. It was an odd summer. At Test level the first and so far only Triangular Tournament took place. In the County Championship Worcestershire finished last and, until Harry turned out in their final fixture, no Foster had played for the county all summer. Seven years previously there had been two occasions when as many as four of the brothers appeared together. In August however Harry, Geoffrey and Tip all turned out against the Australians. Rain spoiled the game as it did so many that summer. Tip’s low key 26 was second top score in a disappointing Worcestershire total. Less than two years later Tip Foster died of diabetes. He was only 36, but in those days insulin had not yet become available. An older sister, Mabel, had died of the same disease in 1903, so there was clearly a genetic predisposition to the disease, although there is no mention of any of the other brothers being similarly afflicted. The oldest of the brotherhood was Henry Knollys Foster, known as Harry, who was four years older than Tip. He played more First Class cricket than any of the others and was Worcestershire captain from 1899 to 1910, with the exception of 1901. He was fortunate in that he was employed by the Worcestershire secretary who came from a very wealthy family and could therefore afford to give his land agent, save in 1901, as much time off as he needed to play cricket. Harry was never capped by England, but was a decent batsman who averaged 34. He scored 29 centuries with two doubles and was over 51 when, in 1925, he played for Worcestershire for the last time. 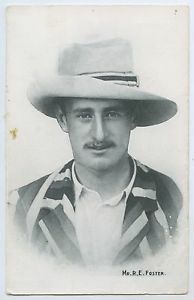 In addition to his playing role Harry was also an England selector, and indeed was one of the panel who decided to offer Tip the captaincy in 1907. After the Great War he was awarded the MBE for his services to agriculture during the conflict, and once peace returned he was a successful Estate Agent in Hereford. Also an all round sportsman Harry was the best rackets player in the family, and possibly the world at his peak. Also a golfer he was, amongst a remarkable family, the only one of the brothers not to play off scratch. In addition to the other six the patriarch of the family, also Henry, was a scratch golfer as was one of his three daughters. Harry was 76 when he died in 1950. Probably the best of the Foster golfers was second brother Wilfrid, known as Bill, setting more than one course record in his time, including a share of that at the Nairn links in Scotland – he was in good company, his co-holder of the record being five times Open Championship winner James Braid. Inevitably he was also a fine rackets player, and a top class centre half on the soccer field. As a cricketer Bill’s career extended over a dozen seasons, but his commitments to his Army career meant that in that time he only played 38 First Class matches. Like his brothers he was a fine batsman, averaging over 30 and making three centuries, as noted above two of them in the same match. An officer in the Royal Artillery he became a Major, and was awarded the DSO. Ill health ended his military service earlier than he would have liked and in 1905 he became a director of a glass company. Disappointed when he was declared unfit for military service in the Great War, instead Wilfrid and his wife threw themselves into work for charities that supported prisoners of war. Adding to the family honours he was awarded a CBE for that work. His wife, Evelyn, received an OBE. Bill worked on in the glass industry until retirement in 1939. By then he was living in Staffordshire. He died in 1958 at the age of 83. Measured by average alone the least successful of the brotherhood was number four, Basil. Four years younger than Tip Basil made his First Class debut for Worcestershire in 1902, and played the last of his seven games for them in 1911. In between he played a dozen times for Middlesex. Altogether there were 34 First Class appearances, but just two half centuries and an average of less than 15. His best performance was for the MCC against the touring South Africans in 1907, when he scored 86. Outside of cricket Basil won the English amateur rackets championship twice, and played football for the Corinthians, one of the leading amateur clubs of the time. Away from sport Basil was a thespian and, after attempting a number of more staid careers, including being a schoolmaster, at the age of 24 he became a professional actor. He was not a tall man, but had a larger than life personality and gained a particular reputation for comic roles. In time he assumed management roles in the West End and in later life ran the playhouse in Salisbury, a lifelong ambition to found a drama school having come to nothing. Basil died in Hillingdon Hospital in 1959 at the age of 77. The fifth brother, six years younger than Tip, was Geoffrey. He is best known today as a member of the all amateur side raised by Archie MacLaren in 1921 to take on Warwick Armstrong’s hitherto unbeaten Australians. His was an odd selection amongst the young students and Test class veterans and he did not play a major role in the famous victory, although scores of 5 and 11 played their part in a low scoring game. Like his siblings Geoffrey was a gifted all-round sportsman winning, whilst at Oxford, blues for cricket, soccer, golf and rackets. He was an amateur soccer international. In 1907 the 22 year old was sixth in the national averages. He had another good season the following year and many flattering comparisons were made with Tip. He might have played against Australia in 1909, but by the time the Australians arrived Geoffrey was on his way to Nawanagar to take up the position of secretary to the Jam Sahib, Ranji. He didn’t return until 1910, and from then until the outbreak of war was occasionally available for Worcestershire. After the war he played a few times for Kent. In a career comprising 141 First Class appearances Geoffrey scored 6,600 runs at 28.32 with eleven centuries. A successful career in advertising beckoned for Geoffrey who also worked tirelessly in administrative capacities for a number of sports clubs. His son Peter played for Kent either side of the Second World War, and his son in law was Gerry Chalk, Kent skipper in 1936 and 1938 who, as an RAF pilot, lost his life in 1943. Geoffrey lived well into his 87th year, dying in Westminster in 1971. Maurice Foster was almost eleven years younger than Tip and the Golden Age was all but over when he became established. Just as successful as his siblings at all sports he came into the Worcestershire side in 1909 and played ten times, averaging just over 23. It was not the most auspicious of starts, but he had a better record that summer than skipper Harry and was, of course, only 20. He was not however seen again until 1914, having left home in the autumn of 1909. Unlike his brothers Maurice was not Oxford bound, but went to Malaya to become a rubber planter. It was five years before Maurice returned, and he played for most of that last pre-war summer, averaging 31 and recording what was to remain his highest score, 158 in less than two hours against Derbyshire. A certain impetuosity cost him his wicket many times and whilst he might not have been the batsman Tip was he was certainly better than a career average of 28 suggests. Back in Malaya during the Great War Maurice returned to his plantation, but recurring bouts of malaria persuaded him to go back to England where he went into the wine trade and later started a building company in Birmingham. This freed him up to play cricket occasionally and in 1923 he was persuaded to accept the Worcestershire captaincy. He held together a very weak side for three summers, scoring more than 1,300 runs each time. After 1926 he played much less frequently, but did not make his final First Class appearance until 1936, by which time he was 47. Sadly Maurice died just four years later. He caught a severe chill whilst serving in an ARP unit during the bombing of Coventry and the combination of that and a recurrence of his previous health problems was too much for the medical science of the day. The last of the brotherhood was Neville John Acland, known as Johnny, who was born in 1890 and so less than two years younger than Maurice, with whom he shared a formidable partnership on the rackets court. As a cricketer Johnny’s talents were the most modest of the seven. He played only eight First Class matches, all for Worcestershire. He appeared three times in 1914 with no success at all before re-emerging for five matches in 1923 when he was a little more productive, his best score being an unbeaten 40 against Derbyshire. As a cricketer Johnny’s most notable achievement came in Malaya in 1927. There was a short tour of the country by an Australian side led by Charlie Macartney. There were some unknowns in the touring party but also Test men Bill Woodfull, Bert Oldfield, Tommy Andrews and Edgar Mayne. In the second and third fixtures against Malaya, who played no one with more than a handful of First Class appearances to their name, the Australians swept to convincing innings victories, which serves only to underline the remarkable first match in the series which the home side won. Johnny led the Malay side in all three matches, and in the unexpected triumph held their first innings together whilst top scoring with 30. Outside the game Johnny wanted to follow Bill into the Army but, although he got through the academic requirements he failed the medical and joined Maurice in Malaya, also returning with him in 1914. He stayed in Malaya for much longer than Maurice however, and as well as his business career he eventually, at least in part, fulfilled his military ambitions by putting together a company of volunteer infantrymen. In time he became a Lieutenant-Colonel, and in 1934 was awarded the OBE. Johnny did not leave Malaya during World War Two and as a consequence spent more than three years in a Japanese internment camp in Singapore. That experience notwithstanding he still did not return to England during the guerrilla war that was waged in the country between 1948 and 1960. Throughout the conflict he followed a personal policy of trying to ease racial tension through sport and a lasting monument to those endeavours was a number of recreation grounds that he established throughout the country. Eventually in 1961 however he did return to England, appropriately to Malvern. He outlived all his siblings, surviving into his 88th year in 1978. Perhaps surprisingly in light of the number of descendants they had between them subsequent generations of the Foster family have produced little in terms of First Class cricketers. Harry’s son Christopher played three times for Worcestershire in 1927 without enjoying any success. Geoffrey’s son Peter played 30 times for Oxford and Kent either side of the Second World War, but an average of 18 with just a single century tells its own story. The most successful cricketer of that generation turned out to be John Greenstock, a son of sister Jessie who played for Worcestershire in the latter half of the 1920s. Unlike any of his uncles, and indeed two cousins, Greenstock was primarily a bowler, an orthodox left arm spinner. The story of the Fosters is a remarkable one, although Tip was clearly in a class of his own as a cricketer. His obituary in The World of Cricket, a rebrand of Cricket – A Weekly Record of the Game that had begun in 1882, is one of the longest articles the magazine ever published, and clearly records the affection the game had for Tip and the respect that was afforded to his ability. He was described as the flower of the flock.